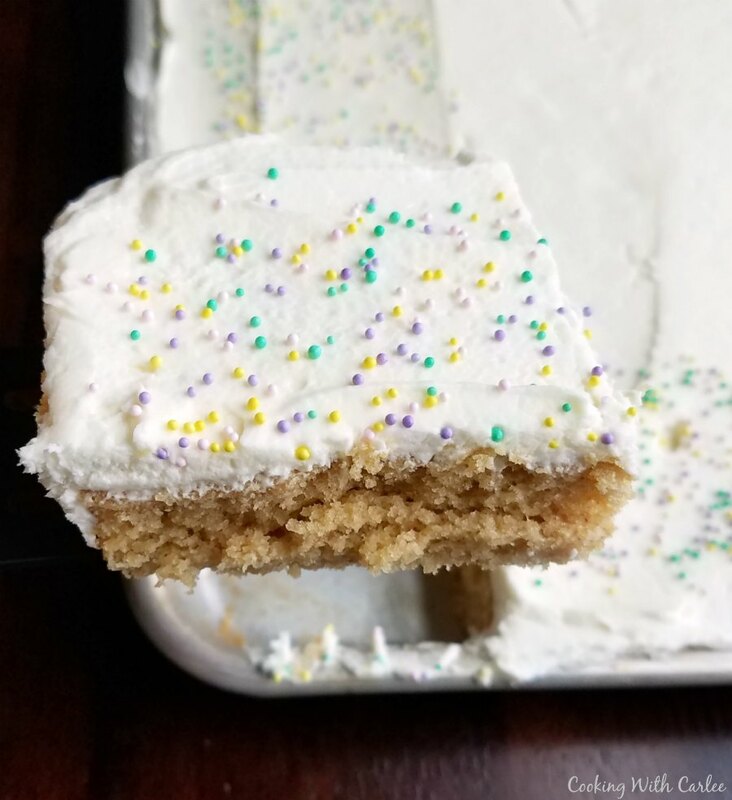 This White Chocolate Buttercream Frosting recipe is one of my all time favorites and I LOVE frosting, so I don't say that lightly. It is so creamy, fluffy and fun and the white chocolate flavor really carries through! This frosting is sooooooooooo good. No really, it is. You would think adding chocolate to the buttercream would weigh it down and make it heavy, but it doesn't! It is so light and fluffy and has a perfect white chocolate flavor. My sister-in-law Jess makes delicious from scratch cakes. She is a self taught cake artist who makes the tastiest masterpieces. Her husband, Anthony, is the pie guy. Last year he did a year of pies, a different pie for every month of the year. This year she decided to do (at least) a cake for every month. She is writing a blog called Year of Cake updating us as she goes, you should check it out. I was lucky enough to get to try her mocha cheesecake and Anthony's birthday cake which were both delicious! She has been using this buttercream as a base for her fondant rather than using a classic buttercream and it knocked my socks off. I just knew I had to do something with it. 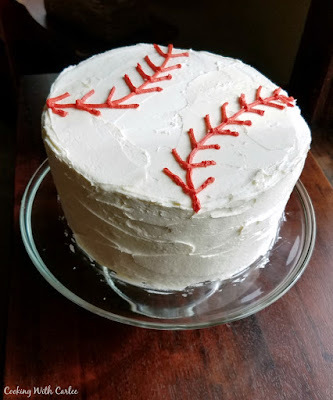 So, I frosted one of Little Dude's birthday cakes with it. Just imagine, peanut butter sheet cake with a nice thick layer of white chocolate buttercream. Oh yeah! I made the frosting and immediately considered canceling the party. That way I could be left alone with my bowl of frosting and not have to share! But alas, I couldn't do that to poor Little Dude. So, share I did. 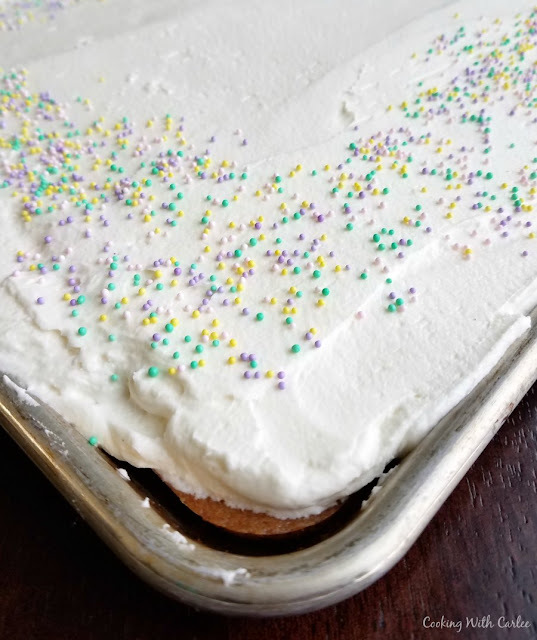 Updating a few years later to tell you that this is still one of my favorite frosting recipes. I have used it a number of times over the last couple of years. Most recently on a cookies and cream layer cake I made for my sister's baby shower. It was soooooo good. But you don't have to just take my word for it. Mollie over at Frugal Hausfrau made it for her Raspberry Filled Cupcakes with White Chocolate Buttercream and she agrees! The addition of white chocolate makes this buttercream even smoother, creamier, fluffier and more delicious! Melt the white chocolate in the microwave by cooking for thirty seconds, then stirring. Microwave another thirty seconds and stir. Continue to microwave in ten second intervals until the chocolate is smooth. Set aside. In mixer bowl, beat the butter on medium speed for about a minute. Add powdered sugar and mix on low until incorporated. With the mixer still going on low, drizzle in the white chocolate. 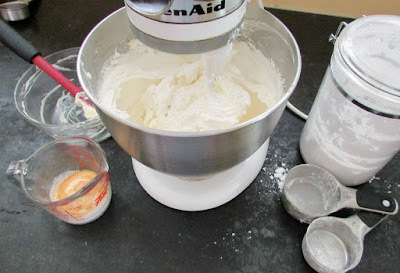 Once it is completely added, turn the mixer back up to medium and beat for two more minutes. Add cream vanilla and salt and beat for another minute or so. Wanted to thank you for coming by my blog the other day and for your sweet comments. Thanks for stopping by! This would be lovely with some coffee. Nice to meet you as well, I hope we bump into each other every so often! This looks delicious! I would love to have you share it on my recipe link up Tasty Tuesday. Everything gets pinned and I would love to have you! Thank you! I'll have to stop by! That look and sounds so so good. The only word is YUM. I have to try that one. I hope you try it and love it! It knocked my socks off the first time I had it. Yum - I cannot wait to try this! So glad the frosting was a hit! Great idea to pair it with a peanut butter cake -- I'll have to try that one of these days. It was really tasty combination. Thanks for sharing the recipe. What a fun post! Peanut butter sheet cake has my name written all over it! Your icing will be the crowing glory. Your shiny chocolate icing looks great, too. I love the idea of a year of pies--and cakes. Isn't the year of pie and cakes so much fun? Both frostings are great. I had to send the leftovers home with people so I wouldn't eat them all! Oh that frosting is just screaming for me to run my finger through it and sneak a lick! :-) Looks mouthwatering delicious Carlee! Have a great holiday weekend! Thank you! The frosting is pretty addictive, so you better watch out! Have a wonderful weekend. I love buttercream frosting! Thank you so much for sharing your recipe with us at Talented Tuesdays! I can't wait to try this! This is one of my new favorites! Jess made a cake with it this weekend so I got to have it two weekends in a row!! You said it right. The frosting is sooooooooooooo good. Just make your reservation ;-) Any excuse to make more frosting is a good one! No need to buy store bought when you can make your own buttercream frosting. Yum. Pinned and shared. Thanks, Quinn! This one is WAY better than store bought. You really should give it a try! 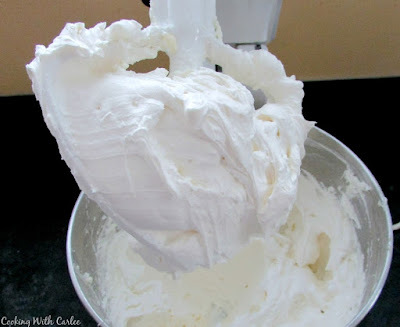 It just seems like everywhere I turn I see a great buttercream recipe! I love it!! This one is definitely worth a try! It amazed me the first time I tried it and again the first time I made it. I need to find an excuse to make it again soon! Ooops, I meant to say everywhere I look on your blog!! You made me laugh outloud - cancel the party, lol! This looks amazing!! Going on my MUST MAKE SOON list!! I hope you love it!! It's so fluffy and yummy! Carlee, I used this buttercream on my Raspberry Filled Cupcakes. It was divine. There's just no other word for it!! I did short the cream just a tad because I wanted to pipe so I wanted it just a bit stiffer and it looked (and tasted) gorgeous! Thanks much for the recipe, and I linked my Cupcakes up to here for your recipe. Isn't it amazing? You're cupcakes look awesome! Thanks so much, Mollie! It is really good! I just picked up some white chocolate bars to make it again. I need to figure out what I want to put it on this time!